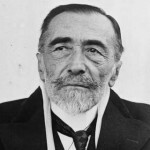 Comments on: "Joseph Conrad Quotes: Thinking is the great enemy of perfection. The habit of profound reflection, I..."
Any fool can carry on, but only the wise man knows how to shorten sail. Some kind of moral discovery should be the object of every tale. It was amazing to think that in those miles of human habitations there was not probably half a dozen pounds of nails. On the contrary, the mere fact of dealing with matters outside the general run of everyday experience laid me under the obligation of a more scrupulous fidelity to the truth of my own sensations. The problem was to make unfamiliar things credible.